Green and Black Cross and the Network for Police Monitoring (Netpol) are offering free legal observer training top activists from across South East England. The free half-day training event takes place in Horsham on Saturday 26 November. 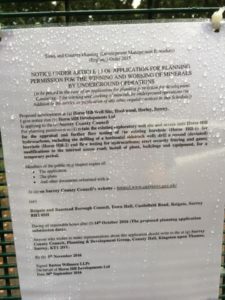 On Monday morning, 10 October, concerned Surrey residents gathered at County Hall, Kingston, to attend a petition hearing, calling for a stop of all unconventional and invasive drilling in Surrey. Mr John Nolan, founder of the campaigning group ‘SURREY AGAINST FRACKING’ submitted the petition which had been handed in along with substantive additional material about the proven dangers of unconventional drilling to the environment and people’s health in the UK. In total over 60 pages of evidence had been submitted individually to councillors and all MPs in Surrey. Horse Hill Developments Ltd expects to submit the planning application for the next stage of drilling at Horse Hill on 14 October, according to notices which have appeared at the site. This will be for further flow testing of the existing borehole and the drilling of a horizontal sidetrack well; drilling and flow testing of a second borehole; fencing, gates, and modifications to the internal access road; and installation of plant, building and equipment.